A fine view across the Lake to the Vale of Grasmere and Dunmail Raise captured probably from a vantage point on Rydal Terrace. 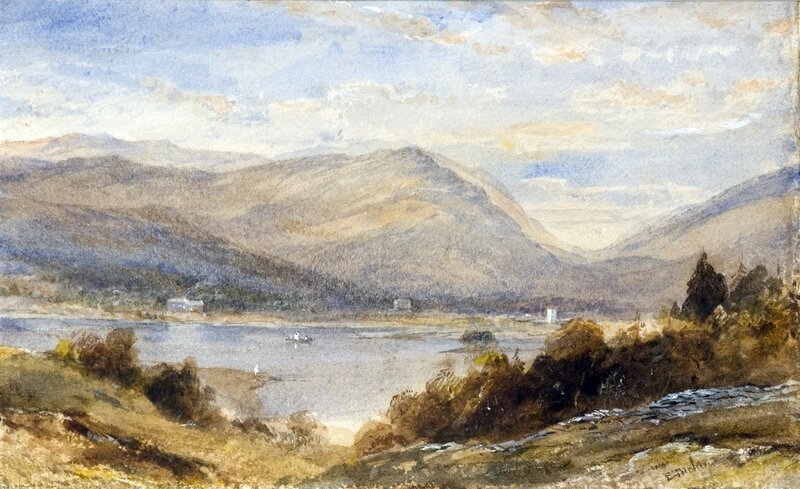 On visiting the Lakes in the 1760s the poet Thomas Gray described it as “ One of the sweetest landscapes that art ever attempted to imitate…………..not a single red tile, no gentleman’s flaring house or garden walls, break in upon the repose of this little unsuspected paradise; but all is peace, rusticity and happy poverty, in its neatest and most becoming attire”. Landscape painting as an art form in its own right was not a popular focus for artists during the 17th and 18th centuries. Portraits were still considered to be the main occupation of the working painter, and landscape was viewed merely as background to these and to historical and classical paintings. However, a new movement was to change this which was the concept of the Picturesque. For the first time landscape and the natural environment were made prominent as a focus for both painting and poetry. In the 19th century the arrival of the railway in the Lakes altered the landscape immeasurably. Terraced houses, villas, country mansions, shops, hotels etc sprang up across the area. This offered artists new paid opportunities to paint the dramatic scenery, the changing light, the towering fells and the tumbling waterfalls and mood changing lakes. They were commissioned alongside artisans to create artworks to adorn the new homes and buildings, and Arts and Crafts enterprises were successfully established. Links were created between painters and the latter, and a colony of artists was established with the Lakes Art Society being established in 1904 with the Tuckers as founder members. Its objective was to promote its members’ works. The Society is still one of the most prestigious regional art societies in the country and is just as active today. Over the years it has included many widely acclaimed artists amongst its members, such as William Heaton Cooper, Sheila Fell, SJ Lamorna Birch, Russell Flint , Claude Harrison and more recently, the award winning Martin Greenland.